Third pub of my Hertford crawl and this was much busier than the Black Horse and the White Horse, despite it being a smaller pub. 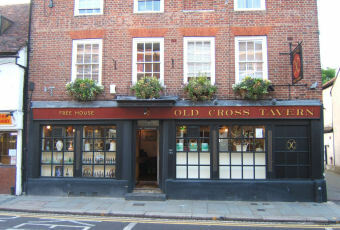 It has its own brewery, appropriately named Old Cross and was dispensing its Autumn Ale. In addition there was Raw Baby Ghost IPA, Wold Top Golden Summer, Timothy Taylor Landlord & Dark Star Espresso. This was the only pub I visited in Hertford not dispensing a real cider. But the Espresso was an adequate replacement for me. The barman (landlord?) was friendly. A beer festival was being advertised for October. The scotch eggs caught my eye too. But I'd already decided to try the nextdoor Chinese takeaway! Runs the Black Horse close as my favourite pub in Hertford. A superb pub with an outside courtyard area. The beer selection included a special house-brew called Eldorado, an elder flower flavoured pale ale at 3.6% which was absolutely delicious (previous reviewer 'dyyony' must have been unlucky). I also noticed a Mighty Oak and Green Jack beer. Locally-made pork pies, scotch eggs and pork scratchings were all very good too. Very friendly landlord. I just wish I lived nearer to it. Excellent pub with a great selection of beers, though I didn't think much of the one they brew on site. Landlord was great, very friendly and helpful. Not much of an outside by the looks of it but inside it has plenty of character - great place, wish I had tried the scotch eggs - they looked great. Top pub. Small, but very good selection of ales, both te ones I tried were faultless. Service excellent. A very sociable place. Small,cosy and still with a good selection of ales. Went in with a group of geriatric delinquents who were quaffing Kwak (too early in the day for me to drink headbang stuff). Had best ales of the day here, which I rounded off with a nice (if strong) Church End brew. It may not have the history but it still is the best pub in Hertford by a good margin.